Justin Bieber: "I Never Met the Woman"
The 17-year-old pop singer appeared on "Today" to set the record straight about paternity allegations. Amid screaming fans and the promotion of his Christmas album, Justin Bieber found himself having to clear the air regarding recent paternity allegations on "Today" Friday morning. The 17-year-old pop singer was on the plaza to promote his new Christmas album, "Under the Mistletoe," which he said allowed him to give back to the food banks where he and his family received food before his rise to superstardom. After talking about his charity contributions, Bieber was questioned by host Matt Lauer about the accusations being levied against him by Mariah Yeater. The 19-year-old woman is claiming she and Bieber had a tryst backstage after one of his shows and that he is the father of her 3-month-old son. 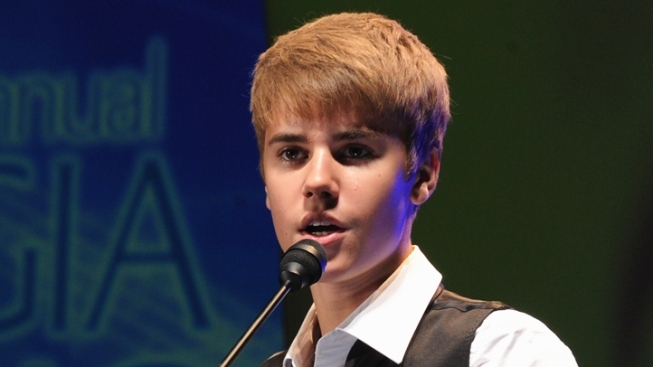 "I'd just like to say, basically, that none of those allegations are true," said Bieber. "And I know that I'm going to be a target, but I'm never going to be a victim." He continued: "I think it's crazy because every night after a show I've gone right from the stage right to my car, so it's crazy that some people want to make up such false allegations. But to set the record straight: None of it is true." When asked by Lauer is he knew Yeater at all, Bieber replied: "Never met the woman." The Biebs thanked his supporters hours later in a tweet. "Thanks to everyone who supports me. much appreciated. grateful. thank u. #focused," he wrote.